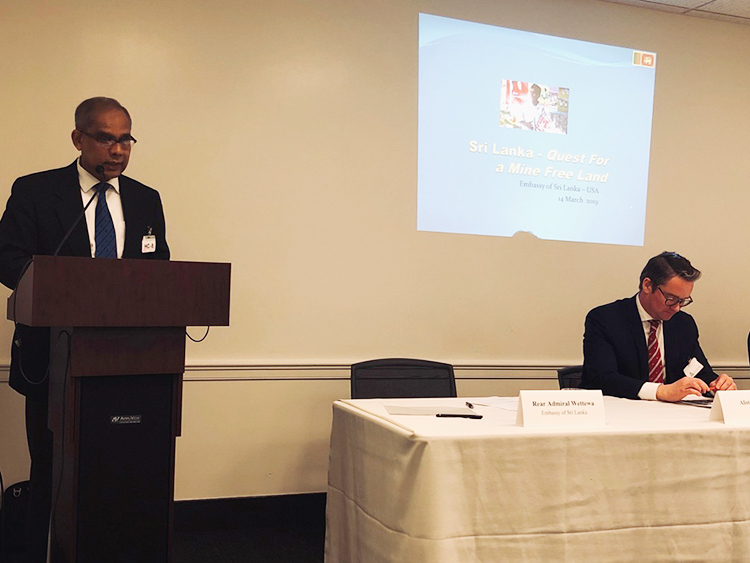 The Congressional (UXO)/ Demining Caucus held a panel discussion on demining efforts in Sri Lanka on 14th March at the Capitol Hill where the government’s ownership of the program and the commitment for a mine free Sri Lanka came for praise by the implementing partners and the US government. 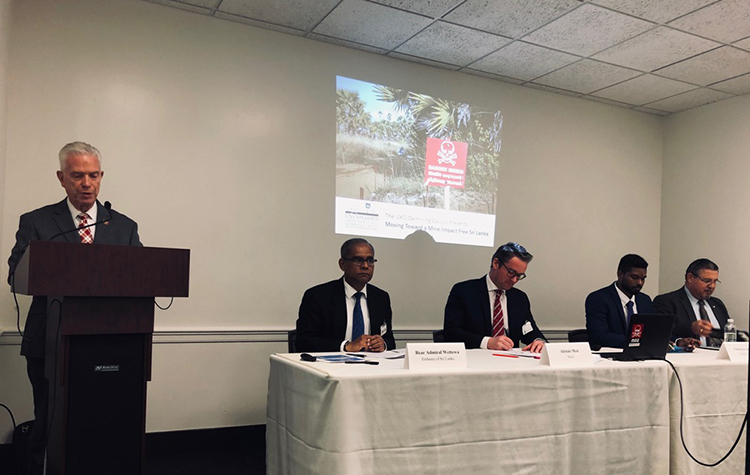 The Panel Discussion was held on the invitation of the Co-chairs of the UXO/ Demining Caucus, Representative Bill Johnson (R) and Representative (D) Jackie Spiers. Rear Admiral Dharmendra Wettewa, Minister (Defence) represented the Embassy at the panel which also included Mr. Alistair Moir, of the Mine Advisory Group (MAG), Mr. Vithoozan Anthony of the HALO Trust and Mr. Rodney A Robideau, the Conventional Weapon Destruction Program Manager, South and Central Asia of the Department of State. Introducing the speakers of the panel, Co-Chair Rep. Bill Johnson spoke about the 30 years long ethnic conflict in Sri Lanka and touched upon the reconciliation and accountability process which he stated U.S.A. is following closely. He recalled his visits to Sri Lanka and expressed his great appreciation to the Sri Lankan government and the international partners, especially the dedication of the women Mine Clearance workers for their efforts to achieve the vision of a mine free Sri Lanka by 2020 and reiterated the U.S. government’s commitment to help achieving that goal. Rear Admiral Wettewa made a detailed presentation of the background of the conflict, the challenge of clearing lands contaminated due to mines and Explosive Remains of War (ERW) and the government’s commitment to achieve the goal of a mine free Sri Lanka by 2020. He elaborated the holistic approach the government has taken by establishing the National Mine Action Center to coordinate the national and international efforts in the challenging task of achieving a mine free Sri Lanka. The National Mine Action strategy looks beyond mine clearance towards the resettlement of affected people on cleared lands enabling access to infrastructure and providing opportunity for economic and livelihood development to ensure a safe and a dignified life. The strategy also includes Mine Risk Education and a victim assistance program to help mine affected victims to become self-sufficient and also a stockpile destruction program aiming to achieve a mine free Sri Lanka. All government institutions and international partners are working together towards this goal. The Minister Defence went on to explain the role played by the international implementing partners like MAG and the HALO Trust who have helped to bring in capacity, technical expertise and international assistance. SLA Army is playing a key role in the process and is also working with the Marshall Legacy Institute (MLI), who have provided 31 Mine Detection Dogs (MDO) since 2002, to increase the indigenous mine detention capability of the Sri Lanka Army. After presenting the main achievements of the National Mine Action Program since 2002, Rear Admiral Wettewa expressed the hope that the international development partners, especially the USA would continue to help in providing the funds required (about $ 20–30 million) for the completion of the mine clearance program to achieve the 2020 goal and thanked the international community for the assistance given up to now. The MAG Representative described the work they are doing in Sri Lanka and expressed their appreciation for the government, Sri Lanka Army and the civilians who are involved in the tedious task of mine clearance and related operations (especially women) for their constant dedication and for the government’s serious involvement in the program. Mr. Rodney Robideau of the State Department spoke highly of the entire Mine Action Program and commended the commitment shown by the government and remarked that this is one of the most significant post war involvement of the history and spoke about the US government’s assistance of over US$ 60 Million up to date. He paid tribute to the implementing partners and was highly appreciative of the role played and the professionalism shown by the SLA with the dedication towards the whole program. Mr. Rodney was very appreciative of the work the MLI has done with the donation and training of Mine Detection Dogs. He assured that the US government will continue to provide funds for Sri Lanka and will even consider adding more to the already committed funds as the year goes by. The representative of the HALO Trust, Mr. Vothoozon Anthony, who is a resident of Jaffna, described the experiences of living his life in the conflict zone and expressed his gratitude to the international assistance given and hoped that the life would become normal for all the people in the region sooner than later. The Panel Discussion was followed by a Q & A Session. The Chargé d’ Affaires of the Embassy, Mr. Sarath Dissanayake and the Second Secretary, Mr. Niranga Palipana attended the event.